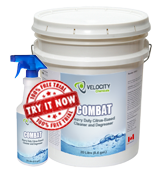 COMBAT is a heavy-duty citrus-based cleaner and degreaser. It is used to clean various soils, including bitumen, fuels, greases and oils. COMBAT can also be used to clean any other metal surfaces soiled with fuels or oils where a solvent-based cleaner is not desirable. Apply full strength at ambient temperature as a pre-soak chemical, followed by the application of steam or high-pressure water.